Most human heads have a pretty simple story. They spend a few decades on top of a body and then, when death arrives, they’re buried or cremated or entombed along with the rest of the corpse. And that’s usually where things end for the average head. But that wasn’t where things ended for the head of Oliver Cromwell. Not even close. A few years after the overthrow of the English monarchy in 1649, Oliver Cromwell became Lord Protector of the Commonwealth. He remained as such until his death (of natural causes) in 1658, upon which he was embalmed and honoured with a very fancy funeral. How nice for him. But without Cromwell running things, the monarchy was soon reestablished and Charles II was brought back from exile to assume his place on the throne. One of King Charles’ first orders of business was to get his hands on Cromwell’s dead body in order to properly desecrate it as punishment for treason. Charles had the body exhumed and dragged through the streets of London on its way to a public posthumous hanging. For several hours, Cromwell’s long-dead body dangled from the gallows, and when it was finally taken down, his head was severed and set atop a tall spike at Westminster. That head just stayed there for years, for decades. I imagine old Cromwell’s decrepit head looking down on the people of London, serving as a revolting reminder not to challenge the divinely-sanctioned authority of the king. 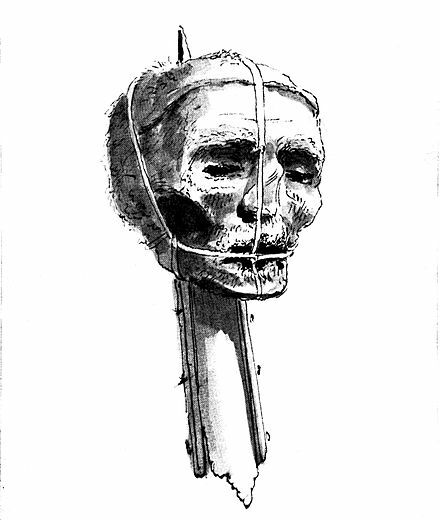 Here’s an 18th century sketch of the head on a spike. Sometime in the late 1680s, a big bellowing storm broke out in London and snapped the spike upon which Cromwell’s head was impaled. The story goes that a sentinel found the fallen head and took it home, where he squirrelled it away in his chimney. After the sentinel’s death in the early 1700s, his family sold the head to a collector of weird and macabre artifacts. Over the next century, the head passed through the hands of several different collectors and freak show entrepreneurs, and in 1812, it was sold one last time to Josiah Henry Wilkinson. While in the Wilkinson family’s possession, the head underwent various scientific tests to verify it as Cromwell’s. After all, the authenticity of a centuries-old head that’s just been kicking around the realm isn’t easily guaranteed. The most conclusive of these studies — performed in the 1930s — declared that the head was indeed that of the Lord Protector. The head stayed with the Wilikinsons until 1960 when someone in the family thought, hey maybe we should put this thing to rest once and for all. It was finally buried — over 300 years after Cromwell’s death! — at Sidney Sussex College, Cambridge, where Cromwell had once matriculated. There was, however, some concern that royalists still angry over Cromwell’s role in the abolishment of the monarchy would dig up the head and screw around with it. So the burial was performed as a very private ceremony, and wasn’t even announced until two years after the fact. 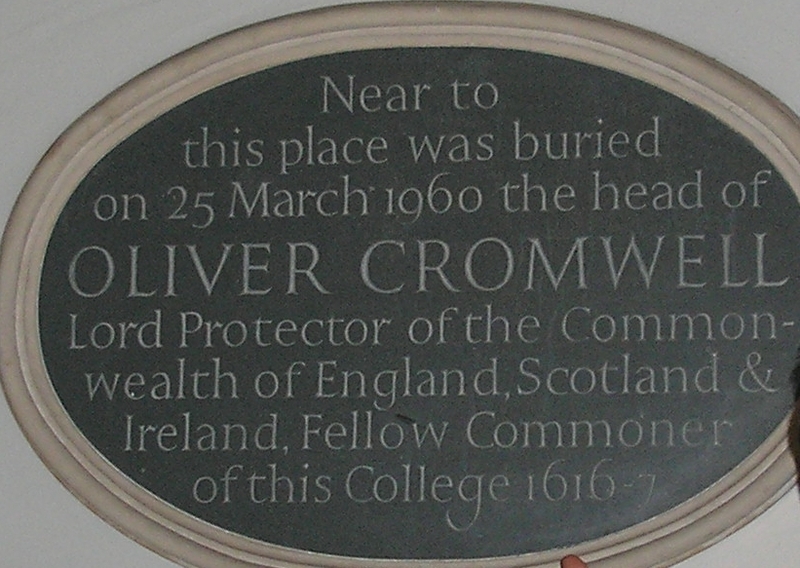 The specific resting spot of Cromwell’s head has been left unmarked. What exists at Sidney Sussex College is just this plaque offering the vague assurance that the head is somewhere nearby. Only a few people in the world know exactly where Cromwell’s head is now. And they’re not telling.